Across Europe, between 10 % and 20 % of all electrical power consumption in industrial and commercial applications is used to operate ventilators in HVAC systems. Energy-saving measures involve upgrading the system or equipping it with high-efficiency, frequency-controlled fans. Within this context, a relatively simple and effective method for achieving significant cost reductions is to use high-quality, highly energyefficient Viledon air filters. Of course, none of the protective objectives can afford to be ignored. Ultimately, the key is to find the optimum combination of the required filter efficiency at the lowest possible power consumption. To make it easier for endusers to select the most energy-efficient air filters, the European Committee of Air Handling and Refrigeration Equipment Manufacturers (EUROVENT) developed a European energy efficiency classification system for air filters as part of the EUROVENT Certification, which is decisively co-developed by Freudenberg Filtration Technologies. In the laboratory method for testing air filters described in the European standard EN 779:2012, both filtration efficiency and pressure difference as a function of dust loading are measured at 3,400 m³/h. From the mean pressure difference averaged over the course of dust loading, a representative energy consumption level can be calculated. On the basis of these figures, it is then possible to simulate in a laboratory the energy performance of a filter over an operating period of one year (6,000 operating hours). The method of calculation is described in the document EUROVENT 4/21. The representative energy value is used for a classification of air filters into energy efficiency classes. The fan in an HVAC system consumes electrical energy during operation, for example, to overcome the filter’s resistance. In the case of variable-speed fans, energy consumption will continually increase as a result of the air filters’ pressure drop. Many conventional filters display unfavourable resistance behaviour. Here, acting sustainably means reducing the pressure drops in the air filter systems to thereby save valuable energy, avoid unnecessary costs, and reduce carbon-dioxide emissions. For the energy-optimized operation of HVAC systems – while simultaneously meeting the need for adequate filter efficiency to achieve good indoor air quality – we recommend Viledon air filters of energy efficiency class A and B. These filters have a large dust holding capacity combined with a low pressure drop curve, which cause lower energy consumption. 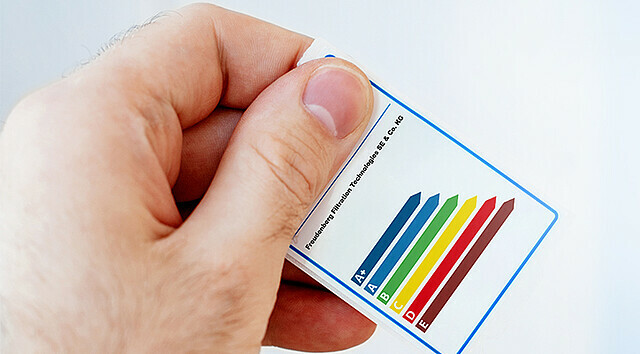 The EUROVENT energy efficiency classes assist you in selecting the appropriate air filters. Improve with Viledon air filters the energy and climate balance of your system significantly. Look out for the EUROVENT labels on our product packaging – they show you the power consumption of Viledon air filters.